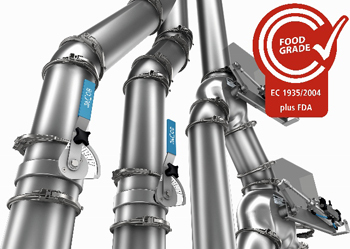 The new JACOB FOOD GRADE range is a modular, stainless steel pipework system with more than 3000 products. In excess of 1000 of these product components, from the stainless steel parts through to the adhesives and sealing materials, were replaced or redesigned to ensure that all food contact parts satisfy the rigorous EU requirements of the EC 1935/2004 directive. The new ‘adhesive free’ vulcanised elastomer U-shaped seals not only ensure food grade compliance, but have better temperature and tear resistance than conventional glued seals. All components that come into contact with food are made exclusively from quality DIN standard stainless steel V2A/1.4301. The use of adhesives is avoided as far as is possible, but in situations where this is impossible, only food-grade adhesives are used.